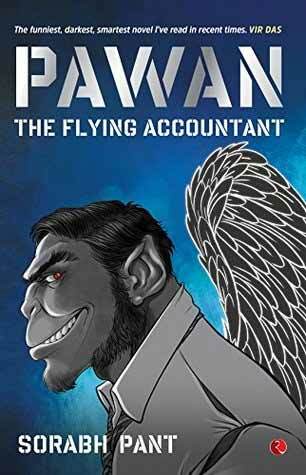 I have to admit Pawan: The Flying Accountant is one of the best books I have from Indian authors recently. Not because it was great on writing elements, but because it was interesting and kept me hooked until I finished it. First thing you’ll notice about this book is its cover which screams out loud everything you’re going to experience: Dark, vile, treacherous, humorous and of course satirical. And, yet, I feel that the cover was a bit comic-like, not that I am complaining. The book is about Pawan, a depressed, dejected and rejected fellow who happened to be an accountant, and has lost the will to live. Why else would he try to get himself killed, despite knowing he cannot be killed. Descended from an elite race of Vanara who are superior than humans in both strength and intelligence, Pawan finds his existence useless unless he meets a secret group of people who wants to hire as a superhero. Well, the idea of a superhero is great. Inherited his powers from great Lord Hanuman (perhaps the first superhero of India), it’s obvious being an accountant doesn’t suit him well. He rejects the offer initially when Rakesh, a stupid but mega-rich businessman, approaches him. When Kelly comes up with the same offer, he finds himself just a little interested but it isn’t until he rendezvouses (tele-rendezvous) with General Taunque and is offered a handsome amount when he decides to team up. So, his mission takes him to North-east part of India where he must rediscover himself and defeat a powerful enemy from across the Indo-China border. More than the storyline it’s the way Sorabh Pant has presented the story is what matters. It’s full of satire and humour at every step. Well, he has spared no one. All big political leaders, businessman, celebrities and small people like us. Everyone has been mocked for all the right reasons. More often than not the author touches raw nerves leaving us thinking and contemplating. Now, the overall plot isn’t too strong and is full of loopholes and unexplained questions arises all the time, but it’s all for fun and can be neglected as such. If you’re looking for an intense storyline with strong elements of literature, then this might not be your cup of tea. Somehow, the author has blended mythology with sci-fiction, sprinkled politics and social causes as seasoning and prepared a great recipe of entertainment. Characterization is fine, if not too great. We get small chunks of backstories on most of the characters involved. At several events we also get little dose of emotion as well. Writing style is brilliant, couldn’t get any darker and humorous. You’re in for a constant ride of roller-coaster without knowing which bomb is going to be dropped at you all of a sudden. Also, the pace of story is so quick that you hardly ever feel what’s coming, which is good and bad at the same time. It gives us little time to connect with the characters, but it helps in enjoying the book more. One thing I totally cannot get the tagline of the book, ‘The Flying Accountant’ considering when he was employed accountant he couldn’t fly, and when he could fly he was no longer an employed accountant. And, even if we ignore that both things didn’t co-exist, the role of him an an accountant was so short-lived to be able to make to the title of the book. Anyhow, that’s for the author and the publishers to decide what title to keep. It does pique some interest afterall. Yet, the best thing about this book is its relevance in the today’s India. Through this book Sorabh has touched many sensitive issues India (and the World) is facing, issues that we need to seriously consider before it’s too late. That’s if we look at the serious side of this book. I would recommend the book for those who have combined interest in fantasy, sci-fi, politics and humor. Not recommended for those who consider novels as textbooks for English literature classes. Overall a fun book to read, rich of dark humor and satire of Indian (and Global) politics and social issues. I would recommend the book for those who have combined interest in fantasy, sci-fi, politics and humor. Not recommended for those who consider novels as textbooks for English literature classes.